Creating systemic change means attacking the problem at its source. That often means working with our City, County, and State representatives to identify the issues and create the solutions that will have long-term effects. 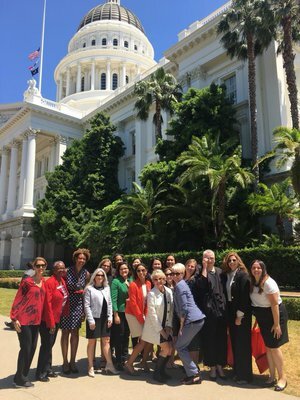 That’s precisely why United Way of Greater Los Angeles brought a diverse delegation to Capitol Day 2018 and joined advocates from across California. The annual event is hosted by United Ways of California and Women United in California’s capitol of Sacramento. “It was fascinating to experience part of the legislative process. In-person advocacy with our legislative representatives and staffers is clearly an important part in a very big machine,” Judy Lai-Norling, Project Manager at NASA Jet Propulsion Laboratory expressed. Judy attended as a representative of Women United and United Way of Greater Los Angeles’ Community Impact Cabinet. 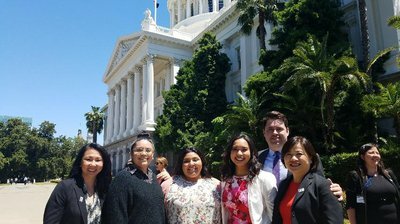 Karen Calderon who is a millennial, promising future leader and LA USD alumnae shone throughout Capitol Day as she met with local representatives and could speak directly from her student experience. A current sophomore at UCLA and alumnae of United Way’s Young Civic Leaders program this was her first time at the Capitol and it was all made possible through the Carol Jackson Legacy Fund and the Martha Anne Roberts Family Trust. Karen went on to be a featured speaker at the closing session as she spoke to the Capitol Day crowd about leadership and how she activates her local community to exercise their civic duty. She also spoke of her experience in the Young Civic Leaders program, where she honed her leadership skills. Through her continued involvement with United Way, Karen continues to advocate for a better way of life for Los Angeles’ most vulnerable residents. Capitol Day isn’t your only chance to get involved. Join Women United on January 19th for the second annual Women’s March Breakfast before we stand with the nation in the third installment of the Women’s March.